Well today I was talking to Max asking him some questions on charcoal bedding slope out of the tuy’ere or nozzle and I kinda let “the cat out of the bag”. 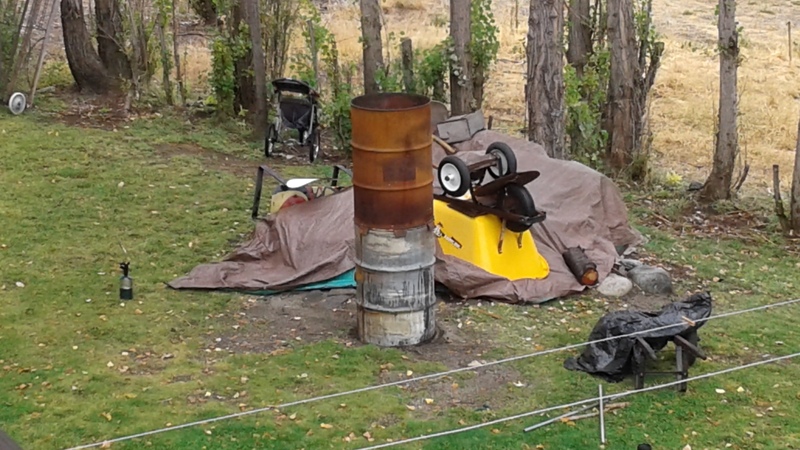 Yes I have been building a charcoal gasifier and yes pictures and videos will be coming soon. It is a cross fire gasifier with a 2" tuy’ere fire brick with 1/2" nozzle inside of it set back 2" into the 2" hole. The 2" will be electronic throttle body controlled air and exhaust. The 3/4 will be open with oil drip if needed. Both have shut off valves and the oil drip will have regulating and shut off valves. The exhaust has a regulating valve no shut off needed. I was not sure if it was going to all come together, but after welding up most of the hopper and fire tube I know it’s going to work. It been fun and I know it’s just beginning. How exactly did you plan to meter exhaust? Did l understand right you plan to put a electronic valve on it? Can you please explain that electronic throtle a bit plese? The throttle body is from a Chevy suburban it uses a electric signal to open , closed and regulate in between. My Son who is into all of these kinds of systems is going to help me on this. When we get it build and working I will post how it works. It will be the last part of the build. I’m planning on using temp. gage to monitor gasifier for exhaust. Also it will have manual regulating valve. Hitachi throttle body off of 2003 Chevrolet Suburban 1500 5.3L gas/flex. List price $338.97. My daughter works for a Auto parts store. She paid $130.47 for it. She put a new one on her Subruban and she gave me the old one that still worked. Michael, yes it seems the younger generation has a lot going for them. My Son Scott has a high performance shop, by appointment only. The cars he builds all seem to start at $100,000.00 plus dollars. I’m glad I had a part in helping him get started. He always has people waiting in line to be next. He had a guy that won a Washington State lottery offered him double his shop time if he could next on the list. He said no, my shop time is $80.00 hr. and he would be glad to built him up any car he wants, but first he had to decide on what he wanted and then wait his turn. I just Love my Boy. Yes, I have had a few of those batches that were just going to go into the garden, ugly charcoal, but wait Gary Gillmore said it all beautiful. You know he is Right. Here are some pictures of my progress so far. The donor car is a 1996 Subaru Outback Legacy AWD. Couple videos will follow. Hi Robert, You are moving right along on this project and I’ll be curious as to how well it works out. Kind of curious how the 1/2" nozzle will work out. In my book I’d be using at least a 1.25" nozzle for that size engine. Are you using a 2" air inlet just because your throttle body is also 2"? So here I have to ask what is the purpose of the throttle body? Restricting the air comming into your gasifier will decrease the amount of CO available to your engine, I keep my nozzle wide open and let the engine pull the amount of oxygen in that it needs. The oil drip is my favorite. At the worst, you will get some oil condensing in your filter. Water is OK, but very variable. If your charcoal is damp, you do not need the water drip, if the air is very cool and humid you may have too much water already, And too much water can condense in you delivery hoses and block them off. Also keep a carefull eye on how you seal up your unit. Those darn air leaks can be a real problem if your unit is not well sealed. You have a little different design and thanks for the video as it really helped me figure out what you are doing. Keep us posted. Gary, yes the 1/2" does seem a little small. I can increase to 1" if I need to. The throttle body will start to open when you press the gas peddle down. This will also be able to be adjusted to when you want it to start opening up to the percent of the Subaru throttle body opening. When the Subaru throttle body is opening and closing the gasifier throttle body will follow to what ever percent opening or closing I want to go, and it will be adjustable from the dash board in the car by a control knob. At idle I want the 1/2" nozzle to be blasting into the charcoal bed, with a little air coming in the 2" tuy’ere and at full throttle I want the 2" tuy’ere opening to match the air needs for the engine and keeping the vacuum at the correct operating value for Gasifiing in the gasifier. Making sure there are no air leaks is a must. Vacuum flexing on the hopper walls is going to have to be addressed to prevent cracking the welds. I think bracing across the walls will work in a few places. I’m planning on using your filtering bucket idea for my filter. With the use of exhaust gas for cooling the temps In the gasifier, I don’t think I will be using any water and just use oil drip for more power. Thank you for your input on this project of mine. If I understand you, the 1/2" nozzle is for maintaining air velocity to keep the somewhat distant charcoal glowing enough to keep producing good gas at idle. Then, when needed under load, the throttle body opens up to allow more air to pass around the 1/2" nozzle. Very clever. With some probes in place, your setup will provide some very helpful info on nozzle sizes and placement. I sure hope this is indeed a good way to prevent oxidation or slagging of nozzles while producing good gas over a wide load range. Can’t wait to see this in action! Also, it is just fun to see the new artistic geometry you have come up with using obtainium. Bruce, you are correct, placing temp probes in the right places will give us some good data to work with. I’ve been thinking of a good place to put a temp probe for the nozzle and tuyere so I can monitor the exhaust gas effects on them and for slag build up in the gasifier. Yes the turn down ratio is the other problem people have when coming to a stop when driving and idling. Also I’m hoping this gasifier will be able to run my 4kw Onan genset on my motor home and run larger engines like a 5.0L size. You just have to have more charcoal. We will just have to wait and see how it all works out. Thank you for your input on this project. I only spotted a stick welder in your shop? I Would not want to even try welding thin metal with one, but they work great as a cutting torch! Thank you. There is a gas wire feed welder right next to the stick welder, only use stick welder on heavier metals. Hi all of you that are on the Dark Side, I have not given up on my gasifier, it just the other side drew me the the light. I thought I would make some fuel for it today, that’s what you do on rainy days, Right. Oh, I feel the Dark Side Pulling on me. Bob you can make charcoal by driving that truck rain or shine. No grinding needed.